Round Obsidian and Sterling Silver Clip-On Button Earrings, "Nightfall Reflection"
Beautiful circles of obsidian, as black as the reflection of a deep, dark night, are showcased in these button earrings. Set in sterling silver, the earrings have clip-on backs. 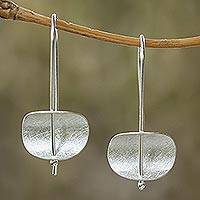 These gorgeous earrings are designed by Sandra and Lily of Peru.